Many parents have bumper pads that they are no longer using. While you may not wish to use them in the crib due to safety concerns, there are many other ways to put them to use. This is a guide about crafts and other uses for crib bumper pads. I have crib bumpers for my twins that I am not using because of safety issues. But they came with the bedding set and are so cute! Any creative ideas for things I can do with them, besides making pillows out of them? Do you have a garage? If so, hang it from the ceiling. When the front bumper touches the pad you'll know to stop so you don't hit the wall. That wasn't a craft idea. Sorry, misread the post. How about simple, small stuffed animals? They'd be easy to cut and sew -- think of a cookie cutter teddy fish or gingerbread man, just larger. Stitch seam binding around the edges. Does anyone have ideas on what to make with a bumper pad? 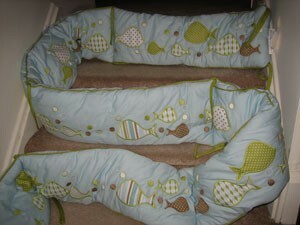 Since it is no longer recommended to use bumper pads in cribs, I'd like to sew something with it - at least use it. Just can't think of anything. Diaper bag or other tote. Pillows for adults and older children that coordinate with the baby room. Wall hangings. Buy or make wooden or cardboard cubes and cover with the bumper pad. How about a "draft dodger" for a door? You would fashion the bumper into a long tube-like shape to place at the bottom of an exterior door to prevent any cold air from getting inside. Alternatively, you could create a window pelmet. Cut the appropriate sized piece of plywood and cover with the bumper pad. Install at the top of a window and add accenting curtains, if desired. Line big baskets with them and use the baskets as toy catchers or organizers. How about making you self a draft dodger. The thing that you put at the base of the doors to keep out drafts. How about sewing a couple together(or even tying the short ends with the attached ties) to make a cirle. Then the circles could be combined to make tunnels or soft shapes to play with. you could make a valance for the windows in your nursery. cut it to size and hem the cut ends, attach ribons every few inches across the top to use as ties on the curtain rod. Do you have any suggestions for what I can do with baby bed bumper pads? They have beautiful designs for children and are already padded. They seem too good to throw. I discovered that turned upside down and tied to the bed frame, these make great dustruffles. They are just the right height. My beds are against walls so I only have 1 length and 1 width to cover. This works best in the design is not directional, but who's gonna get clos enough to tell. Or, you could remove and reverse the ties. I cut our old bumper into sections and sewed the edges, added a pocket and made them into tooth fairy pillows for my daughter and her friends. they make great containers like easter baskets toy containers, etc. make a circle or square the size of your container bottom and match the bumper pad to fit all the way around. cut and inch longer and sew together then make a handle. You can just use them to cover coffee cans or boxes. Sorry not good at directions, but if you are crafty you sure can figure it out!